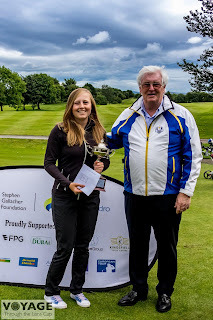 Claire McLaughlin won the Handicap Trophy in the Stephen Gallagher Foundation tournament at Bathgate last week. In this 54 hole event, Claire had nett scores of 66, 61 and 77 - CSS was 70 for all three rounds. Well done Claire! Freya Russell playing in the Tom Lehman at Troon recently, won the Girls Handicap Trophy. Once again Freya came through Regional qualifying in the Wee Wonders and heads to St. Andrews at the end of the month for the Finals! Congratulations Freya and good luck! Down in Wales the young guns have got off to a fantastic start, with the girls team posting a convincing 7-2 win in the first day of play over Wales. With our Ayrshire girls bringing home 3 points! The women's team unfortunately did not have the same success on day one suffering a 2.5-6.5 defeat to their Welsh counterparts.